Click the buttons below to Download our “Identify Connected Structures" PDF file. 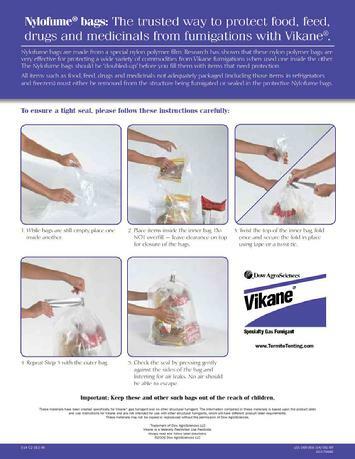 What do I need to do to prepare for the fumigation with Vikane gas fumigant? In addition to the work performed by your fumigator, it is your responsibility to help prepare your home for the fumigation. Taking the following steps prior to fumigation helps ensure its success, resulting in the elimination of drywood termites from your home. Check with your fumigator for additional home preparation information. Remember to make arrangements for overnight accommodations for you and your pets, as your home may be under fumigation 4 to 72 hours. Most fumigations are between 12 and 18 hours. Please keep in mind the fumigation may need to be rescheduled if the weather is uncooperative. High winds and rain may hinder a fumigation and cause potential danger to fumigators. 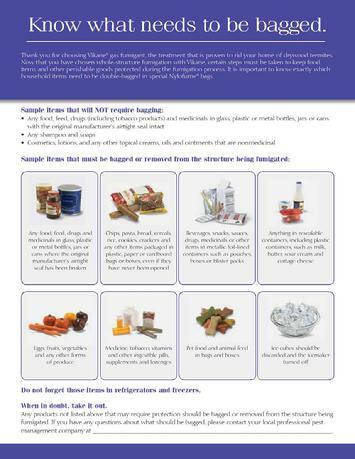 Be sure to remove or double-bag anything that will be ingested (medicine, spices, ect.). It is unnecessary to wash dishes, linens, clothing, ect., as Vikane is a gas and will dissipate from the structure. Remember, once your fumigation is complete, all termites in your structure should be eliminated.